On Friday, Sept. 21 Governor Rick Scott announced the appointment of Undersheriff Carmine Marceno as Sheriff of Lee County following the retirement of Sheriff Mike Scott. Carmine Marceno has been with the Lee County Sheriff’s Office since 2013, most recently serving as Undersheriff for two years. 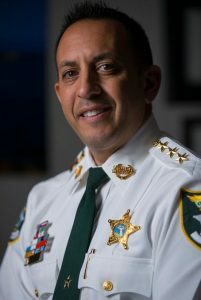 Prior to his role as Undersheriff, Marceno was a Lieutenant in the Public Services Division and came to LCSO after holding numerous positions at the Collier County Sheriff’s Office, including Assistant to the Sheriff. He began his career in law enforcement approximately 20 years ago, and in March of 2017 he graduated from the prestigious FBI National Academy, Session 267. Carmine Marceno plans to run for the seat of elected Sheriff in 2020. Sheriff Mike Scott’s official last day was September 24.